Home > Greeting Card Boxes > Greeting Card Box Kits. Brand new octagon greeting card box 8”x8” in affect a 8”x8” box with the corners cut off. The design is such that tape is required for the tabs. Red liner tape is more than adequate which we also sell. You will receive FREE Card blanks & acetate with your boxes as you can see from the picture the box has an aperture cut out the top of the box. We also have another box that is the same but without the aperture cut out which you can find in our shop if you think that one better suits your needs. 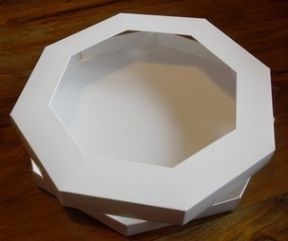 Our greeting card boxes are cut from top quality boxboard; Card blanks are 300gsm pristine white card. This box is approx 22mm deep so you can send it cheap with royal mail large letter. These boxes are sent flat packed so you will need to make them up when they arrive to save you high postage costs. Box Base – 8 1/8” x 8 1/8” – 207mm x 207mm. Box Lid – 8 ¼” x 8 ¼” – 211mm x 211mm. Card Blank – 8” x 8” – 202mm x 202mm.